Here is another section from chapter 9 of my book. Standing on the edge of the five-foot high platform, Luke wondered if his teammates would catch him as he fell backwards off the platform and into their hands. His eyes were covered, but he could hear his teammates encouraging him to fall back. Although his arms were folded across his chest and his back was to the group, he knew that the eight of them could easily catch him. The real question was could he trust them? 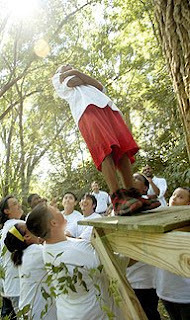 Have you ever participated a team-building activity like this? Each member of the group has to depend on his teammates as he falls backwards into their arms. It builds trust and unity in a group, but it is extremely difficult, even if you are the last person to go and you have seen everyone else safely caught. It is hard to trust others, whether it is our parents, siblings, teachers, pastors, or friends. It can be especially hard to trust God because we cannot see him or hear his voice, but it is essential that we learn to totally trust him and his promises. It isn’t enough to just know God or believe the gospel. To live the Christian life, we need to trust him; we need to rely on his character and power in every moment of every day. Whether we experience trials or blessings, we need to believe that God is wise, loving, and fully in control of our lives and our world. I found it hard to trust God as I mourned Trevor’s death, but the more I did it the easier it got. Every day I felt God enable me to trust him and his ways more and more. The more we choose to trust God instead of our own understanding (Proverbs 3:5-6) and the more we understand that he is faithful, loving, kind, all-powerful and wise, the easier it is to trust him. As we trust him through difficult trials and important decisions, we will see his constant care, comfort, and guidance for us.